A group of Birmingham residents are helping to tackle societal stigmas and urban exclusion in a series of short zombie films that they are producing and starring in. After securing funding from the National Lottery’s Big Local programme, locals from the Firs and Bromford neighbourhood in the north-east area of Birmingham have been working alongside Birmingham City University staff and students to tackle some of the negative connotations that residents felt were strongly associated with where they live, including high levels of youth crime, anti-social behaviour and high levels of unemployment. The residents, of mixed ages and backgrounds, have produced three short films and have developed the Bromford Film Unit which will help to train other residents on how they can create their own documentaries that explore issues of regeneration and intergenerational identity. “We’ve had such bad press over the years and I want people to know that it’s a wonderful place to live and that the people that live here are great”, said Phil Howkins, a local resident from the Firs and Bromford community. The locals hope that theBromford Film Unit will help to re-engage marginalised groups in neighbourhood communities by tackling social and political messages through entertainment. 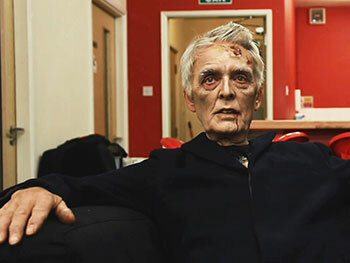 “Zombies are the perfect model to talk about marginalised groups”, said Xavier Mendik, Professor of Cult Cinema Studies at Birmingham City University. Xavier crafted the National Lottery Big Local bid that led to the funding of the project and has been working with the local residents to produce their documentary films. In ‘They Live Outside’, characters represent the tensions that exist between different age groups living within the community, whilst ‘Brombies’ is a mock documentary that explores alienation on the Bromford estate using zombie film motifs. As part of the film production process, Xavier invited residents into Birmingham City University’s School of Media, where they were able to use industry-standard lighting and studio equipment. Xavier now returns to the Bromford Film Unit on a monthly basis to run masterclasses with local residents, alongside colleague Michael Bickerton, who teaches at the University’s School of Computing and Digital Technology. The sessions have focused on filming on a smartphone, how to construct narratives and how to interview characters. “It has been such a rewarding experience”, said Michael. I’ve witnessed a change in the residents we’ve worked with, who are now more confident and have a deeper understanding of film making practices, as well as having three films they can be very proud of. With future funding, it’s hoped that the project can extend into a second year and expand into different communities. It’s also hoped that two members of the Firs and Bromford community will be joining Birmingham City University in September, whena suite of new film courses launch. Ben Lee, trustee of the Big Local programme, part of the National Lottery’s Big Lottery Fund, added: “Universities across the country are evolving into more civically engaged 'anchor institutions' by utilising their knowledge base in locally-focused collaborations. The way this has been achieved through Birmingham City University’s collaboration with the Firs and Bromford community is surprising, joyous and inspiring. The below short films were produced by residents from the Firs and Bromford neighbourhood, with support from staff and students at Birmingham City University’s School of Media. Learn more about Birmingham City University’s film and media courses at www.bcu.ac.uk/clearing.